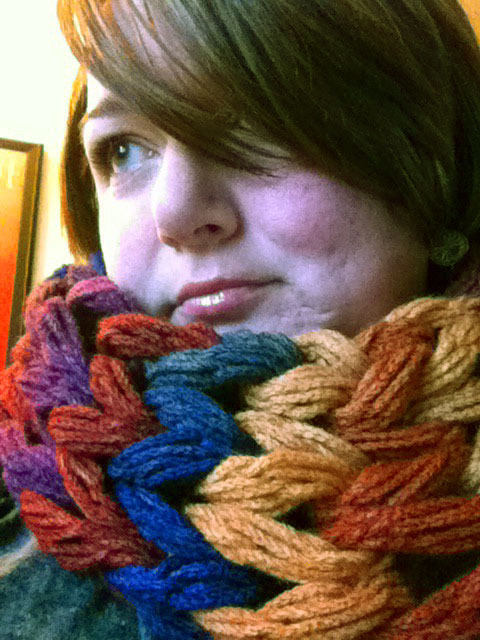 I am the Mad Knitter, well I am also Liz Bleacher and currently live in York, Pa. I am a transplant to the East Coast, I miss my Washington State. I lived in National Parks most of my childhood, my dad is a career Park Ranger. I grew up in Forks, WA, yes that Forks. I love the Pacific Ocean and miss living minutes from the water. I do love it here in Pennsylvania and I am getting use to the snow and humidity. I have recently decided to be a part time worker and full time knitter, which is keeping me busy and my husband a little crazy. All my yarn is slowly taking over our home. I love to knit! It is my stress relief, my comfort and sad to say my addiction. If I’m having a bad day yarn and books makes everything better. I am always up for suggestions of new projects to try, nothing is too out there. I promise, I’ve made a ferret sweater. I sell my wares online at TheMadKnitterShop and at shows around Central Pennsylvania. Let me know if I can do anything for you or you have questions, themadknittershop@yahoo.com. Hi! I’ve nominated you for a Liebster Award! I love your blog and think that you have a lot more to share with the blogging world! If you’d like to accept the award, visit my blog at thenoveltyknitter.wordpress.com for instructions. Thanks for your time, and I can’t wait to read your future posts! Thank you for the nomination! I will get on that asap. Love you about photo, great scarf. Knitting is soo theraputic. Glad I found your blog. I completely agree about the therapeutic qualities of knitting. It’s what I do when I’m stress. Alright I do it all the time but especially if I need some relaxing. Your work is beautiful, Liz. My dad taught my sister and I how to crochet when I was 8 and she was 10. He took us to the Dime Store, let us each pick out a skein of yarn, a beautiful colored hook and he did the same for himself along with an instruction booklet. We walked home and all sat on the couch on a cold Saturday afternoon and he read through the book and learned how to crochet and then taught us how to. What a wonderful memory! My sister and I both knit now as well and we also find great comfort in working with yarn. Thanks for sharing your talent and love for yarn work with the world! Thank you so much. What a great story about learning, I love to hear that crocheting and knitting are passed through the generations. My mom has also taught one of my brother how to knit although I think he has moved on to wood carving. Yarn is my happy place. Liz, your blog looks great. And I have to admit I am a compulsive knitter, also. I once helped a woman leave her husband. She had a protection order and was escorted home to pick-up her children. She had just a few minutes to get her children, but she couldn’t leave her home without her crocheting. 1st her children and next her hook work. And knitting is that important to me, too.